This blog shows my activities and other people's initiatives. There are also articles that have been contributed. 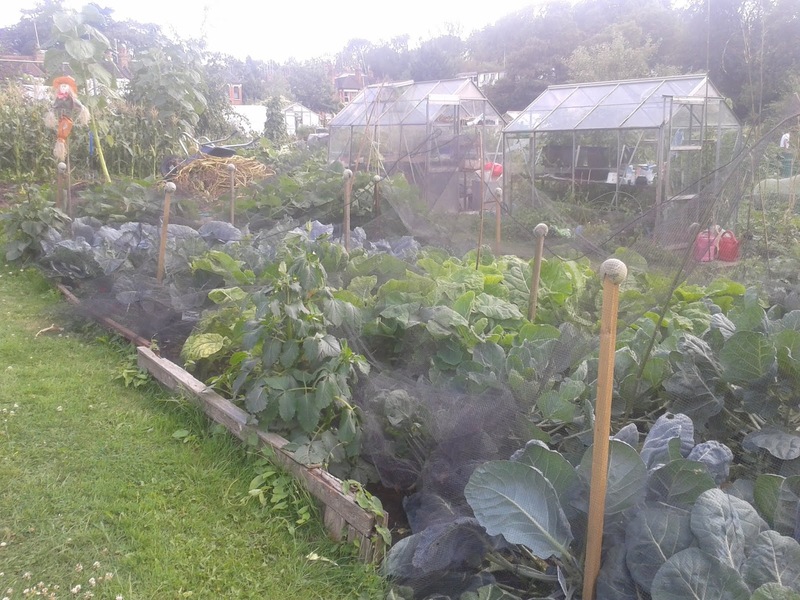 Take a look at 'What's happening on the vegetable plot. Don't forget to click 'more' to see the rest. There are now new pages on this blog. By clicking on the pages link on the right hand side (half way down) you will find a variety of articles. Paul has kindly allowed me to reprint articles from his website however I recommend going to see the full range of interesting articles. See address below. On Page 3 there is an article by Paul Brecher. my Teacher, which is an introduction to the martial art of Pa Kua Chang. A new article by Paul Brecher has been added to page 3 The Wooden Man Form. For more information on this please contact Paul. These have been reprinted by kind Permission of the author. These articles and more can be found on his website: www.taiji.net You will also find information about his classes. Paul also teaches a no nonsense methods of dealing with difficult violent situations. For more information look at this website. Paul brecher has also published a number of books. Two of these can be found on page 3. Go to his website for more details and to see a great deal of fascinating material. The link above is an explanation of the origins of taiji from Wutang 700 years ago.. This will give a 'taster'. Paul's classes are stimulating and hard work an a way to really 'get to know who you are'. Paul will ask you what you want . He will teach qigung and the Taiji form if preferred. . Together with that there is great comradeship in the class and a desire to assist people to enjoy the 'voyage of discovery'. Paul has also introduced his perception of Wing Chun. and explains the links. Last night, in class, apart from Paul's way of teaching Wing Chun we were shown his new additions to The Small San Sau. Page 5: Contains articles by the blog author. The latest is: The secrets of Drip irrigation. I have added a new page showing some of the paintings of Matan Peles , a resident of a community for adults with learning difficulties on Kibbutz mahanayim, Upper Gailee, Israel. I recommend looking at these photos which can be purchased online. Every painting purchased is more support for the community. You can see more of his paintings on their url: www.Yahadbagalil.org.il The site is in Hebrew but there is a translate button on the right hand side. Page 8 There is an explanation of the Shaw Trust, a Horticultural Project for Adult with learning difficulties. A brand new page has been added 'Poems by Mark Shuck' . Anyone who has been troubled by squirrels in the garden will surely relate to the first in a series. inappropriate and likely to cause offence. See an amazing array of skills . Tanya Seifert also offers private English lessons to foreign students. There is an in depth explanation of how to grow sweet peas by Professor David Young. Having spoken to him has stimulated me to 'Have a Go'. I am pleased to say that I have sold my old rotavator . I took time to teach the purchaser how to use it and I provided some technical information. Today with the assistance of some builders I had my new rotavator transported to the allotment . I tried it out on one of my plots. I have been given access to a greenhouse which has an electricity supply, Which I don't have in my greenhouse or polytunnels. I sowed some exhibition onions. I also sowed leeks and some tomato seed which is early but I had itchy fingers. I ordered some field grown Kale and Red Cabbage plants. They look strong . I will plant them out. Due to the plants having been field grown I thought I could risk planting them out which I have done on the top. As I felt there was adequate space I allowed for wider spacing 18 inches. I left net laying on top but I will knock in posts so a to raise the net. Dug over more ground in front of fellow plot holders greenhouse who is allowing me to use his greenhouse as it has electrics. Yesterday I cleared and topped up the first raised bed no 1 which is used by my wife. I also cleared the second bed which will be used by friend and added a layer of compost. I have completely emptied the communal compost boxes. I rearranged pots and trays behind the greenhouse on staging and moved a waterbutt . I took some red Cabbage up to John's greenhouse which has electricity. They haven't really put on significant growth (whereas the cauliflower have) and I wanted to try to give a boost. Despite the lack of entries I have been visiting the allotment. I repotted the onion seedlings in John's greenhouse and haven't finished as there was a lot of bind weed. Yesterday I discovered that the top bar and some of the net on the 'cage' had caved in .……………………………………………………………..…………..……………………………. I wasn't onsite the last two days . I visited today to decide with R where to place the load of manure due next Friday. Discovered that the cage that R built with my assistance is in a bad way due to the weight of snow .It will have to be rebuilt. am considering using it as an opportunity to move it on to the other half of the plot , I think I had a bad year, last year due to the proximity to the trees. . I have ordered some Asparagus crowns which I have never grown due to it not being and immediate crop. I shall also grown Gobo or Burdock which I grew a few years ago. Other than that there wasn't too much I could do due to snow still on the ground and the cool weather. My slug/snail traps arrived. I purchased some beer for them. I want to try and stop using [pellets. Friday I have arranged for a trailer load of manure . I see it as almost a 'religious event. Sowed Cauliflower and pepper seed (sweet). I left them in the greenhouse that has electricity on a heat pad. Put down Beer traps for slugs and snails. Hopefully these will be efficient and I can stop using slug pellets. Repaired the Cage that had caved in due to snow .It still needs work as I am short on wood and it needs straightening . R , a fellow plotholder has offered to help . His DIY skills are better. Manure delivered by tractor and trailer from a farm is due on Friday. After spreading I will rotavate it in . The weather wasn't too great wind and rain. The affects of storm Erik . Other parts of the country were worse off. I was there to wait for a manure delivery but having arrived early I sowed some seed . Tomatoes that I had taken the seed from shop bought Tomatoes that had come from Mexico. I have done this before. It maybe a little early but I also sowed some Aubergine and something new for me Sea Cabbage. The other day pricked out onion seedlings into pots. and cabbage seedlings. To day filled wheelbarrows of manure for fellow plotholder . Rotavated T's plots and then rotavated in manure on my plots. Checked my Aubergine, Tomato , and other in J's greenhouse. I am using it because of the electrics. With the unusually warm weather all my seeds are germinating well. Seeds I sowed in the polytunnel and lay dormant are poking through. I have planted more garlic cloves and replanted onions that had been growing over the winter .I gapped up rows to make more room. Have worked on the cage which was damaged by the snow , It's not what it was but it does the job. A few days ago I sowed Parsnips and then covered the row with polythene. A bit of a risk .. Rearranged the greenhouse . Added a trestle table. I have been sowing and taking seeds that need heating to another plotholders greenhouse as he has electrics . Planted Red cabbage grown from seed . I took down much of the cage including the net as it keeps breaking . Apart from other smaller jobs and planted Strawberries, I have been transferring the cage on the lower plot to the other half and it will be smaller in size which may stabilize it. I still have quite a bit of work to do. I wanted to transfer it as I felt that, last year, Brassicae suffered from the shade of the trees and possibly the tree roots in various ways. Today I vacated the greenhouse belonging to a fellow plotholder which has electrics as I felt it better to rely on my own greenhouse which does conserve natural heat. If the weather suddenly changes for the worse I will just have to start again. pulled out some Brassica which were eaten by snail . I will have to re establish beer traps. Meanwhile had to resort to slug pellets . Lots of lettuce and pak choy in the polytunnels . Picked some . Sowed more Brassica in trays. Nearly finished vegetable cage. On Friday I took a U3A group around. I have planted some Brassicae , Red cabbage which I grew from seed . Re established the beer traps . I placed them in holes in the soil to stop them being blown by the wind . . Sowed various other seed in the greenhouse . Planted out two fruit bushes in the lower plot . Potatoes have been plant out behind the polytunnels. I dug over again two areas on the lower plot as I felt I needed to turn in the manure more. Dug a trench for runner or other climbing beans and filled it with compost. I then covered it with soil and a set up canes. Sowed two rows of pak choy on the upper plot and covered to give some protection. removed hoops that were holding the net over the pak choy and kol rabi (which haven't germinated yet ) . I am fast coming to the conclusion that seeds often just wait for their chance ad then germinate when the time is right. Built a wooden frame instead . Put some Brassica into a cold frame having removed them from the greenhouse. Planted onion seedlings on the lower plot. Sowed some rows of carrots , root parsley, radish with a melon taste (hopefully). I am taking chances with the weather as it is but surprisingly the parsnips are showing. Planted another fruit bush, Blackberry. I also planted Asparagus crowns. In the greenhouse . I have sowed more trays with sweetcorn ( a bit late though I have some coming through) and celeriac. All of this without extra heating . So rather a risk. I decided not to use paraffin this year. I have been checking the drip pipes on the raised bed and also lifted some loose slabs behind the raised beds in preparation for cementing. I have sowed more seeds including Okra . It has been cold and some plants seed to be slowing up in the greenhouse . I visited a fellow plotholder whose greenhouse I used earlier had turned on a fan heater . I took advantage and brought some trays and pots with tomato plants and other up. I notified him by email. an then you will fall asleep. page 1 A bit about the author of the blog. To brighten your day I recommend a look at Lucy Seifert comments on Twitter. Lucy Seifert also works with clients Via Skype. If you have found reading about Yahad Bagalil interesting please follow the link and take a look at the wonderful work and vision of Yahad bagalil http://vimeo.com/46433037Donations to this wonderful project are welcomed. If you wish to donate please go to their website. For those of you interested in the Internal Martial Arts please take a look at the following links kindly supplied by Paul Brecher. I found Paul Brecher's book a fascination description of his travels in search of more understanding of the Chineses Internal Martial Arts and the Taoist way of Life. The first half of the book depicts his experiences travelling, training in the Martial arts and experiences learning various meditation techniques. The second half shows various meditation techniques and philosophy. Throughout the book is beautifully illustrated. Here is a quote from another of Paul's books ' College of Chinese Martial Arts Training Manual. 'Ultimately we should not be seeing the opponent as someone we should defend ourselves against. Rather we should see them as a person who does not understand the law of cause and effect and they have chosen us to help them understand'. Paul Brecher has just published a new book: 'Dim Mak for Martial Artists'. Another book that maybe of interest written by Paul is a 'A Taoist Way of Life'. More details can be found on his website: http://www.taiji.net/ To get an overall picture I recommend going to the free video section. FOR PAUL CLASSES PLEASE GO TO HIS WEBSITE . Paul has now also introduced elements of Wing Chun into his sessions. Explanations are also given of the accupuncture points and how it relates to Martial arts and health. enjoying a variety of events. Well worth a look! Paul Brecher provides a sample of The Wooden Man. Can be found on His site in the video section or Utube. This year’s exciting 40th Anniversary Spring Festival will be held on May 19-20-21st 2016 on and around the pastoral lawns and beach of Nof Ginosar Hotel on the shores of Lake Kinneret. From Thursday afternoon until late Saturday afternoon, the festival features 37 concerts, 5 dance workshops: American folk dancing, Swing and Irish folk dancing, 3 Body & Soul dance workshops: NIA, Rio Abierto and Tedarim Betnuah, Yoga, Tai Chi/Chi Kong, Master classes in Blues Harmonica, Ukulele and Voice Strategies for Singers, Jam sessions of all types in every possible corner, Juggling, and other fabulous activities in the Jacob’s Ladder spirit. Handicrafts for children, swimming in the lake and pool and free camping make this a perfect weekend for singles, families, teens and seniors.